Waffle House Road to CMA Fest Sweepstakes! Enter to win a trip for two to the 2017 CMA Music Festival to meet and greet country star Chris Janson! One grand prize winner will receive a trip for two to Nashville, Tennessee to attend CMA Fest (on 6/9/17 and 6/10/17). Prize consists of round trip airfare, hotel accommodations for two nights, ground transportation, two fan passes to Warner Music Nashville fan parties on 6/9/17 and 6/10/17, two general admission tickets to the CMA Fest concert at Nissan Stadium on 6/9/17 and 6/10/17, meet and greet with Chris Janson, and two gift bags with Warner Music Nashville, Waffle House, and TouchTunes-branded items. Ten others winners will receive a $100 Waffle House gift card, Warner swag bag consisting of Warner Music-branded items, and 100 TouchTunes credits. 1. Visit a Waffle House with a TouchTunes digital jukebox and complete the electronic entry form. 2. By visiting a Waffle House and checking in on the TouchTunes Mobile App for iOS or Android. 3. 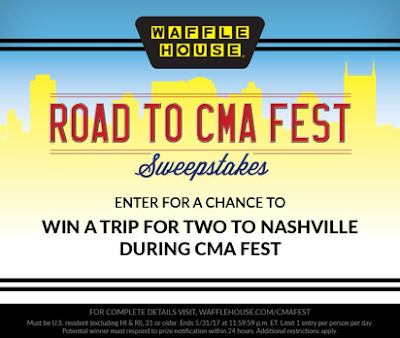 You may enter by completing an online entry form at wafflehouse.com/cmafest. Limit one (1) entry per email address per calendar day, regardless of method of entry. CMAFestMeetandGreets.com is merely reporting the availability of this contest and is not affiliated with, endorsed, sponsored by, or in any way officially connected with Waffle House, TouchTunes Music, Warner Music, or Chris Janson.